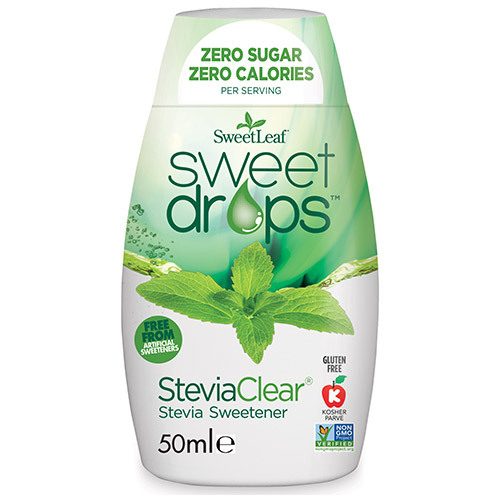 SweetLeaf Sweet Drops are convenient, sugar-free, calorie-free natural flavoured sweeteners available in five delicious flavours. With just a squeeze, Sweet Drops can turn any food or beverage into a sweet, flavourful, zero-calorie experience. Extracted using water and not alcohol or chemicals, the SweetLeaf Sweet Drops range does not have any bitter after-taste - just lots of flavour! Safe for diabetics and all ages, including small children. Just add a squirt to your tea, coffee, hot water, shakes, yoghurt, ice cream, or even porridge for a sweet sensation without the sugar! Per serving, SweetLeaf Sweet Drops have NO sugar, NO calories, NO artificial sweeteners, and they are Kosher and Non-GMO certified. Available in a convenient handbag size of 50ml, this product really is sweetness on-the-go! Find your favourite today! Available in 5 flavours; SteviaClear, Vanilla, Caramel, Chocolate and Coconut. Glycerol, Purified Water, Sweetener - Steviol Glycoside (E 960), Dietary Fibre. Squeeze to your taste in tea, coffee, hot water, shakes, yoghurt, ice cream, or even porridge. Does not need refrigeration. For best quality, use within 30 days of opening. 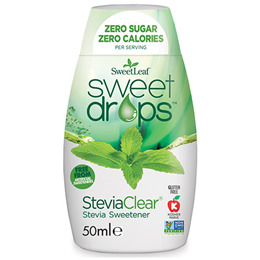 Below are reviews of SweetLeaf Sweet Drops SteviaClear - 50ml by bodykind customers. If you have tried this product we'd love to hear what you think so please leave a review. This is easy to use and tastes good too.